Hope you are having a great week! Can you believe Valentine’s is tomorrow? I swear this month has flown by. Today I wanted to share with you a fun Galentine’s Sprinkle Brunch we threw for our expecting friend Michelle. If you don’t know what a sprinkle is, it is basically a smaller intimate baby shower for a mom who is expecting her second or third child. Basically an excuse to celebrate such a wonderful blessing in our friend’s life. This Galentine’s sprinkle wouldn’t have been successful without the help from each one of these girls. Everyone contributed their own special touch which made it that much more special. So if you are looking to throw a Galentine’s Sprinkle here are some tips for hosting a Galentine’s Sprinkle Brunch! Hey everyone, can you believe the 4th of July is just around the corner? I’m excited to celebrate our Independence Day with friends and family. This year, I wanted to share an easy and fun DIY Dr Pepper float station for your next 4th of July party. It will sure be a hit with your guests! Nothing says summer like a Dr Pepper float, and if you are in Texas, where it is hot as hades, then this makes the perfect party drink to keep you cool and refreshed. Check out how you can recreate this 4th of July inspired Dr Pepper float station below! Today I am excited to share our holiday travel plans plus this travel essential gift guide and GIVEAWAY with Lipault Paris. Next week after Christmas our family will be headed for a fun family road trip with our in-laws to New Mexico and Colorado for a week. We will actually be ringing in the New Year in Colorado! This is our first ever holiday vacation with Jayden and our first time in Colorado and New Mexico. We can’t wait to be going with Josh’s family too. When Josh was a kid he had fond memories of family road trip with his family so we are keeping the tradition alive with Jayden. Plus it will be such a beautiful trip with the mountains and snow. So whether you are taking a road trip, or flying somewhere special, or know someone who loves to travel here is my travel essentials gift guide that is perfect for Christmas! So excited to share my favorite gift guide of them all. Why is it my favorite you might ask, because I had so much fun hand picking each gift idea, and honestly it would put a smile on my face if I got anything on this list. If ya’ll know me I might be slightly obsessive about my fur babies. Haha next to Jayden they are the cutest things ever. I tell my son pets are angels sent from heaven to watch over us. Anyone else agree with me? So today I can’t wait to share with you this pet lover gift guide for that person in your life who just loves their pets as much as I do, and a little tidbit about each of our fur babies and why they are so special to us! Read more below. Thank you Minted for partnering up with me on this post. As always all thoughts and opinions are mine alone. Thank you for supporting those who support this blog. I am so excited to share with your our Christmas card photos with Minted. I’ve been working all day to send them out to all of our family and friends. This year for our shoot we decided to go downtown to change-up the scenery. We always do our cards in a more country setting, but this year we wanted to do something a little different. We wanted to go with a more urban lifestyle scene. Today on the blog with Minted I am sharing 5 Tips for Fun Family Pictures with Toddlers and my gift guide for him (there’s a giveaway for him too!). See our looks and cards below! Ya’ll I can’t get how stinking cute these pictures of Jayden are. Seriously that smile melts my heart! This stage is my favorite stage. Jayden loves Christmas, and has been counting down the days till Christmas comes! 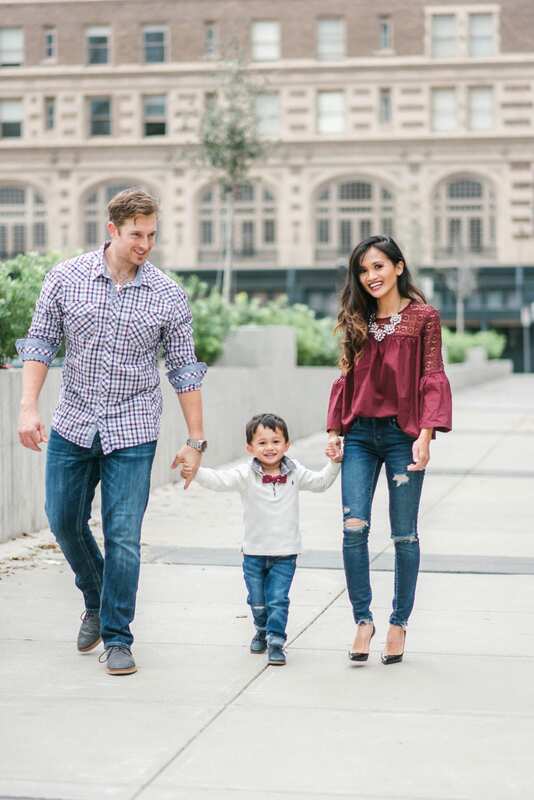 I created this gift guide for toddlers and some of my favorite things for Jayden including items I’ve personally bought for him and he has loved! 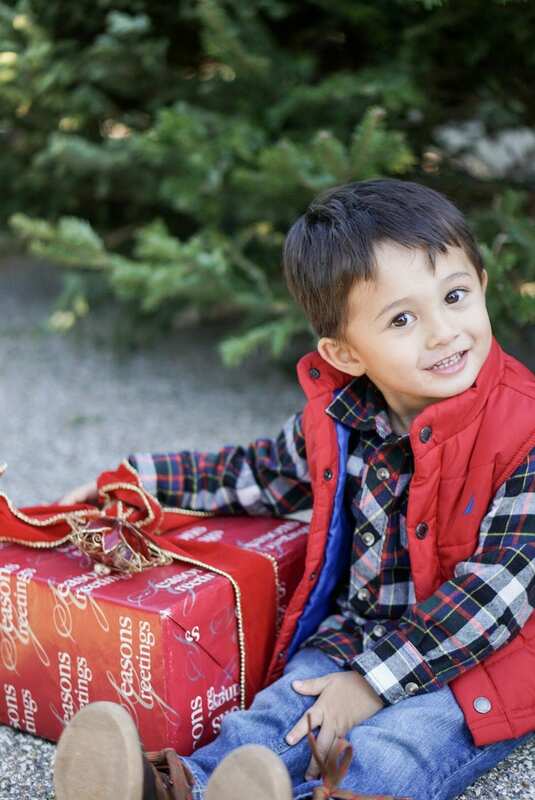 Check out my gift guide for toddlers and these adorable pictures of Jayden! This weekend I am extra excited because my hubby and I will have a kid free staycation at the newest luxury Hotel Alessandra. My husband turns thirty this month, but unfortunately has to work on his birthday, so we decided to celebrate early on his weekend off. We have a weekend of relaxation and fun planned, starting with a spa date at the Hotel Spa and then ending with a fancy dinner out Lucienne Restaurant. I honesty can’t wait. But before we do all that I wanted to share with you one of my favorite knot back sweater for this cute and casual winter look plus my gift guide under $50. Check it out below! Thank you Be Good for Children for sponsoring this post. As always all thoughts and opinions are mine alone. Thank you for supporting those who support this blog. Three more weeks till Christmas and we are counting down the days with my little guy. Every year it get’s more and more exciting as Jayden grows and realizes more what Christmas is all about. We have been watching Christmas shows and movies all year to prepare for this time, and Jayden is so excited for Santa. He tells us non stop how Santa is going to give him presents. His Great Grandma even got him an Elf on the Shelf this year. However, I don’t think he quite knows what it is other than something he wants to play with lol. But as much as Christmas is for the kiddos with presents and Santa, I also wanted to make sure Jayden knew what the true meaning of Christmas and why we celebrate it. Today I partnered up with Be Good for Children to share with you our night-time routine, and how we are teaching our toddler the true meaning of Christmas.